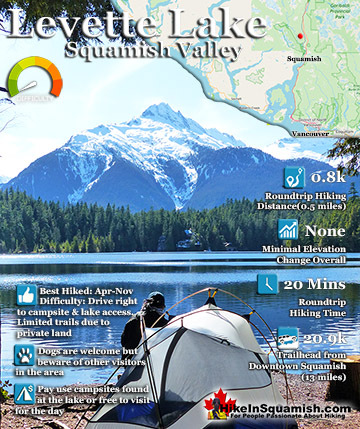 Squamish sits in the midst of some amazing places to hike. Garibaldi Provincial Park sprawls from Squamish up and beyond Whistler. Tantalus Provincial Park lays across the valley to the west and the beautiful and desolate, by comparison, Callaghan Valley to the north. 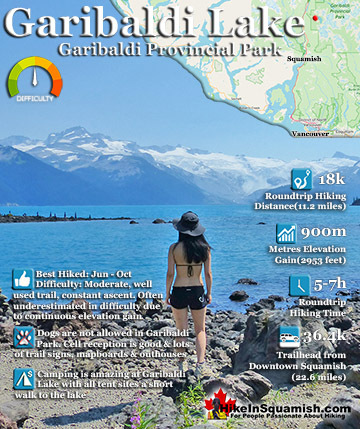 Garibaldi Provincial Park wraps around Squamish and is home to some amazing hiking trails. 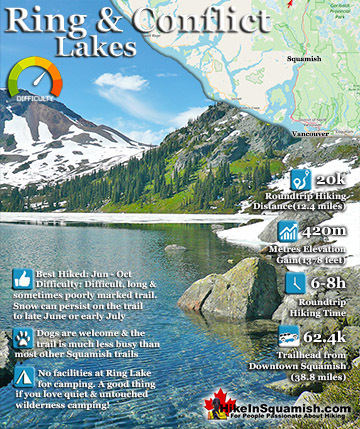 Garibaldi Lake, Panorama Ridge, Black Tusk and Elfin Lakes are all wonderful hiking destinations is this extraordinary Provincial Park so close to Squamish. Alice Lake is a great place for camping swimming, fishing and hiking. 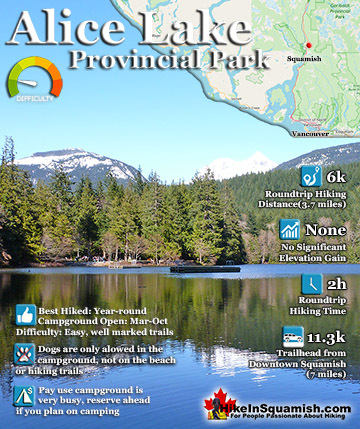 Alice Lake Provincial Park is comprised of four lakes, Stump, Fawn and Edith Lake as well as the much larger Alice Lake. There is a nice trail, the Four Lakes Trail, that runs past them all. 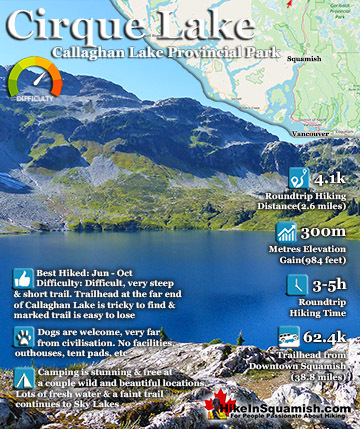 Compared to other Squamish hiking trails, Alice Lake is very easy and relaxing. No serious hiking here, but rather walking, talking and enjoying the beautiful forest and lakes along the trail. Black Tusk is the extraordinarily iconic and appropriately named mountain that can be seen from almost everywhere in Whistler. The massive black spire of crumbling rock juts out of the earth in an incredibly distinct way that appears like an enormous black tusk plunging out of the ground. Whether you spot it in the distance from the top of Whistler Mountain or from dozens of vantage points along the Sea to Sky Highway, its unmistakable appearance is breathtaking. Brandywine Falls is one of the must see sights on the drive to or from Whistler, and arguably the nicest of Whistler’s numerous beautiful waterfalls. Located about halfway between Squamish and Whistler, the falls drop from a 70 metre/230 foot, unnaturally abrupt looking cliff to the valley below. 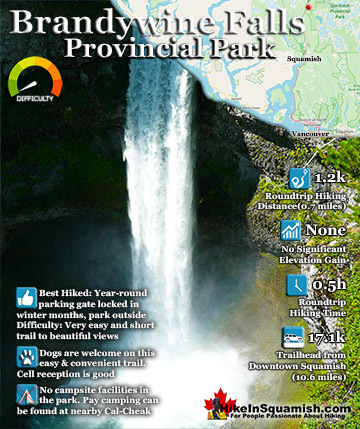 Brandywine Falls Provincial Park is such a popular, accessible and beautiful sight that it has a large and elaborate viewing platform directly opposite the falls. 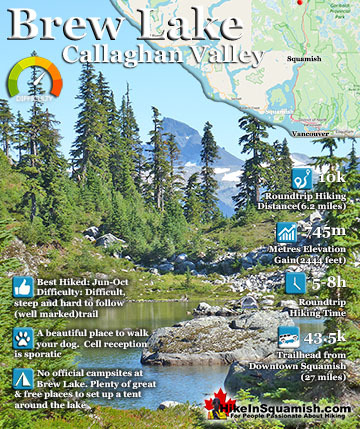 Brew Lake is beautiful mountain lake just a short drive south of Whistler and is relatively unknown and seldom hiked. Laying at the base of Mount Brew, Brew Lake lays in a massive alpine valley of enormous erratics. On first seeing Brew Lake it looks serene, yet wild and hostile. The lake is surrounded on one side by idyllic tree covered hills and lakeside cliffs and on the other side a brutal looking wasteland of huge boulders sloping up to the sky. Cirque Lake is a wild and beautiful lake that hides high above and beyond Callaghan Lake in Callaghan Lake Provincial Park. What makes Cirque Lake special among the other sensationally beautiful lakes in the Whistler area is both its location and geologically formed shape. It sits high above Callaghan Lake, which itself is a gorgeous, mountain lake. The remoteness of Callaghan Lake is a bit of a mirage due to the fact that you can drive right to it. 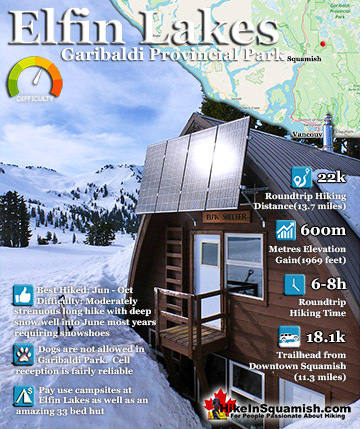 Elfin Lakes in Garibaldi Park is an absolutely phenomenal, though long, hiking, biking, snowshoeing and skiing trail that begins at the Diamond Head area in Squamish. 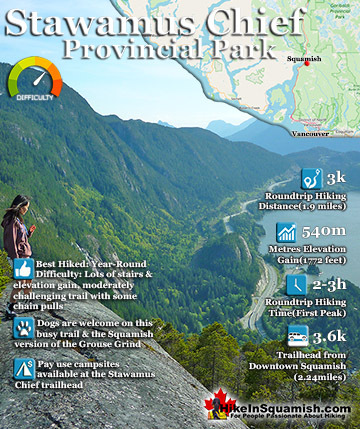 From downtown Squamish, the trailhead is just a short drive away, located near the south end of Garibaldi Provincial Park. 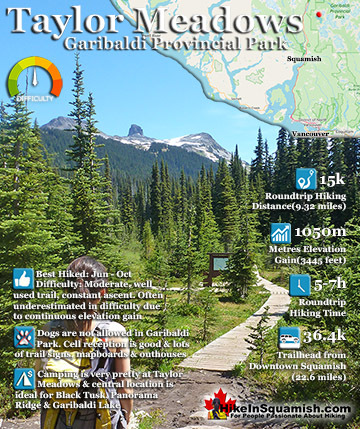 Garibaldi Park is the massive wilderness park of nearly two thousand square kilometres that stretches from Squamish to Pemberton. 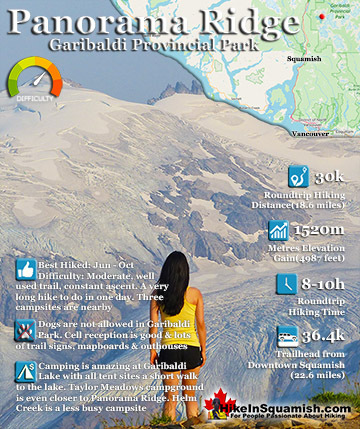 Garibaldi Lake is the centre and base for much of the hiking in Garibaldi Provincial Park. The Garibaldi Lake campsite is located on the amazing, turquoise shores of this massive and mostly still wild mountain lake. There are no trails around the edge of the lake except the small section leading to the campsites, so your view is an impossibly coloured lake edged by swaths of forest and a magnificent glacier towering in the distance. 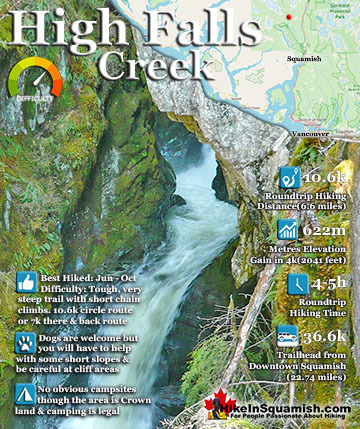 The High Falls Creek hike is a great hike not only for the beautiful scenery in and around the trail, but the drive to it as well. The often passed by Squamish Valley Road, opposite the Alice Lake Provincial Park access road, is wonderful. This glacier carved valley stretches on and on, along the majestic Squamish River. The trail is well marked and though steep at times is moderately challenging. Levette Lake is a nice mountain lake located in the enormous Squamish Valley that drains the Squamish River into Howe Sound. There are some nice views and minimal elevation gain along the trail. The amazing Tantalus Range on a sunny day look fantastic from the shores of Levette Lake. There is a nice campground on the shore of the lake that is well laid out and very rustic. Panorama Ridge is easily one of the most amazing hikes in Garibaldi Provincial Park. 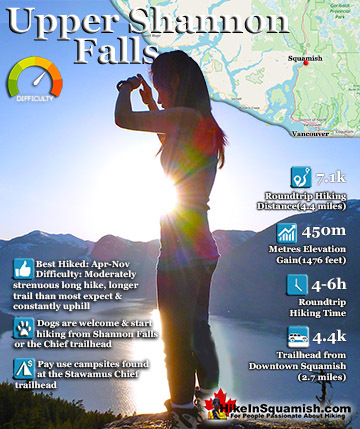 The 15 kilometre(9.3 mile) hike from the trailhead at Rubble Creek to Panorama Ridge takes you through beautiful and deep forests, across countless idyllic streams, through meadows filled with flowers, and past dozens of jaw dropping viewpoints. The amazing views start once you reach Taylor Meadows and get even more spectacular as the trail progresses. Ring Lake is a fantastically beautiful and wonderfully remote lake similar to Cirque Lake but considerably farther to hike to reach it. The 10 kilometre hike takes you through a tranquil forest, then to a spectacular meadow filled with ponds and ringed with distant, enormous mountains. 5 kilometres into the hike you come to Conflict Lake with trails running around it. 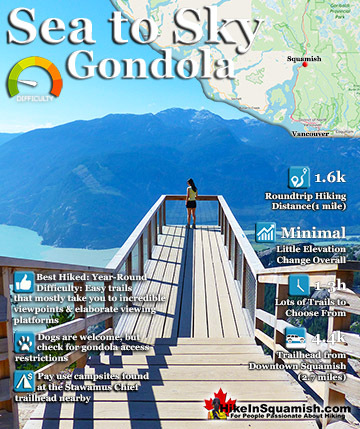 The Sea to Sky Gondola opened in the spring of 2014 and has rapidly expanded into a marvellous array of hiking trails and mountaintop attractions. 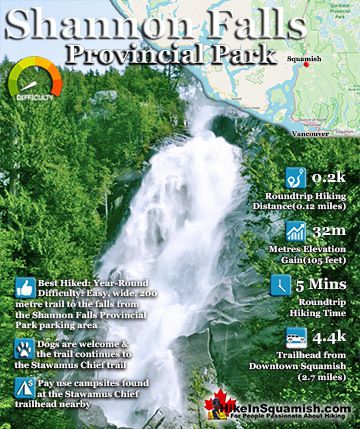 Located between Stawamus Chief Provincial Park and Shannon Falls Provincial Park the gondola carries you rapidly from the sea to the sky. Departing just a few hundred metres from the ocean at an elevation of 35 metres, to 885 metres in just 10 minutes. Stawamus Chief is the mammoth rock face that towers over Squamish. Though hardly believable from looking at, the summit is a fairly easy, though very steep hike. In fact there are three peaks, South (First), Centre (Second), and North (Third). Each accessible from the single trailhead. Growing in popularity as the newest brother to the Grouse Grind in Vancouver because there are quite a few stairs and considerable elevation gain. Taylor Meadows is a beautiful campsite and alternative to the much busier and more well known, Garibaldi Lake campsite. Located in between Garibaldi Lake and Black Tusk itself. It is reached from the same trailhead to Garibaldi Lake. There are 40 very nice tent platforms, toilets, a good water source and a food cache, all in the lush forest of Taylor Meadows with the distant view of Black Tusk. 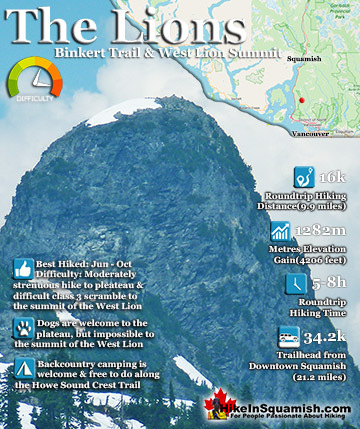 The Lions or Twin Sisters lie in North Vancouver, south of Squamish. The two distinct, rocky peaks are visible from downtown Vancouver. The one on the left, the one pictured above, can be climbed. You don't have to, however, as the plateau before this difficult summit has amazing views. In fact, most finish their hike to The Lions here at this wonderful(second) plateau(pictured here), with the towering West Lion so close.